The Bicycle as a Great Solution | Home of the Crofton Bike Doctor Blog! It’s been awhile since I wrote. I debated about a couple of topics I’ll get to each but for today I thought I would write about the bike, the environment and our health. When you talk to your friends about some of the issues that concern them the conversation may turn to: Obesity, especially childhood obesity, dependence on foreign oil and the length of their commute in the morning, i.e. traffic congestion. Guess what? The bicycle can help us with all of those issues. For me one of my concerns is obesity especially childhood obesity and the affects it has on today’s youth. It amazes me how many children are obese. Additionally on my mind and I am sure I am not alone is rising fuel costs. Yes lately they have been much better. Interestingly the bicycle can help in both of these areas. In the US 50% of car trips are less than two miles. Currently less than 1% of trips in this country are made by bicycle. (In Holland it is 30%) Some cities are doing a better job then others; Boulder, CO is already at 21%, Davis, CA is at 20%. Minneapolis is at 2% – well above national average, but with room for improvement. What if we started to reverse this trend? Think about what it could do to help with childhood obesity. Or better yet the rise in childhood diabetes. 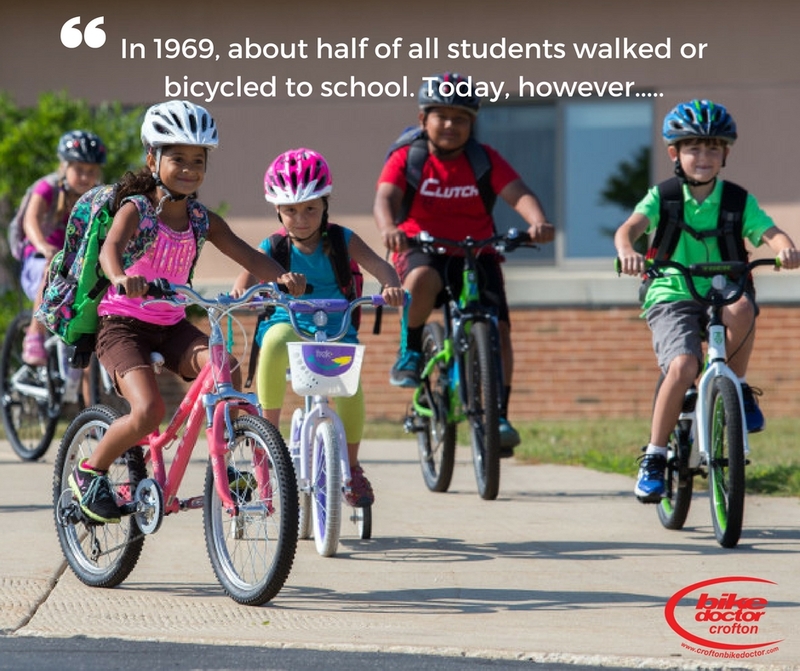 One great place to start is Safe Routes To School. If kids include cycling as a part of their life when they are young they are more likely to continue to ride as they grow older. What a great health gift you would be giving your child! Cycling is a healthy low impact fitness activity that they can participate in for life. Do you have children? What if you rode your bike with your children to school? For families that’s have children within walking distance to school you could certainly ride your bikes there. I live near a school and it amazes me how many parents are driving their children to school versus walking or better yet, riding their bikes. The cars waiting to drop their children off at school backs up in front of my house almost every morning. Sure some parents look like they are dressed for work and dropping their children off on the way, many do not. Most Americans can easily ride a bike 2 miles. How many of your errands could be done on your bicycle? What if you used your bike for only three or four errands a week? Think how that could improve your health and save on your gas bill and reduce the maintenance needed on the family car? What if you brought your family along? Now the family is participating in a healthy activity while spending time together and getting the errands you need done. The bicycle of today is easy to ride and ideal for basic errands such as going to the grocery store the video store or even your local hardware store. I’ve set up my wife’s bike for some basic errands. We’ve installed a rear rack on her bike and some grocery bags. These bags are made by Bontrager and are the exact size of a brown paper grocery bag. You can take the bags into the store do your shopping and then attach the bags right to the back of your bike. She rides down to the store for the little odds and ends we need from the week for the store. Since we live so close to the store she often takes the longer route to either get there or come home to add to the work out. If you think of some of the simple trips you make today and would get in your car for, how many of them could you be doing on your bike? According to the Surgeon General, approximately 300,000 U.S. deaths a year currently are associated with being obese or overweight. This compares to 400,000 deaths a year associated with cigarette smoking. In 2002, obesity-related medical care spending accounted for 11.6 percent of all private health care spending, compared to just 2 percent in 1987, concludes Health Affairs. Bicycles cost far less than automobiles to purchase and maintain, and do not require a continual intake of increasingly expensive gasoline. Between six and twenty bicycles can be parked in the space a motor vehicle requires for parking. Bicycles also cause little, if any, wear and tear on roadways. Motor vehicle emissions represent 31 percent of total carbon dioxide, 81 percent of carbon monoxide, and 49 percent of nitrogen oxides released in the U.S. (The Green Commuter, a publication of the Clean Air Council). A short, four-mile round trip by bicycle keeps about 15 pounds of pollutants out of the air we breathe. (WorldWatch Institute). According to the Nationwide Personal Transportation Survey, 25 percent of all trips are made within a mile of the home, 40 percent of all trips are within two miles of the home, and 50 percent of the working population commutes five miles or less to work. Yet more than 82 percent of trips five miles or less are made by personal motor vehicle. 60 percent of the pollution created by automobile emissions happens in the first few minutes of operation, before pollution control devices can work effectively. Since “cold starts” create high levels of emissions, shorter car trips are more polluting on a per-mile basis than longer trips. A Rodale Press survey found that Americans want to have the opportunity to bike to work instead of driving, with 40 percent of those surveyed saying they would commute by bike if safe facilities were available. According to the Bureau of Transportation Statistics (BTS) October 2000 Omnibus Household Survey, 41.3 million Americans (20.0 percent) used a bicycle for transportation in the 30 days measured in the survey. Bicycling is the second most preferred form of transportation after the automobile, ahead of public transportation. More than 9.2 million (22.3 percent) of the 41.3 million people who bicycled did so more than ten of the 30 days. Several findings from the BTS study indicate a growing concern among Americans with the impact of transportation choices on quality of life—and a willingness to consider bicycling as part of the solution. Half of all Americans (99.0 million people) believe that cars, SUVs, pickups, and vans are the primary cause of air pollution in their communities and 65 percent (135.4 million) are concerned about the level of traffic congestion on the roads in their communities. (They have a right to feel this way: Americans spend 75 minutes a day in their car.) Some 79.1 million (38 percent) of all Americans feel that the availability of bikeways, walking paths, and sidewalks for getting to work, shopping, and recreation is very important in choosing where to live. Motor vehicle emissions represent 31 percent of total carbon dioxide, 81 percent of carbon monoxide, and 49 percent of nitrogen oxides released in the U.S. (The Green Commuter, a publication of the Clean Air Council). Short car trips (over distances that could easily be bicycled) are much more polluting than longer trips on a per-mile basis because 60 percent of the pollution resulting from auto emissions is released during the first few minutes of operation of a vehicle. 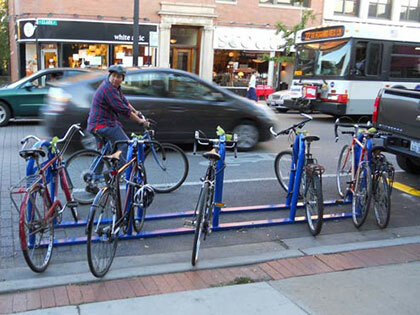 Number of bikes that can be parked in one car parking space in a paved lot: 6 – 20. Number of racks for bicycle parking in Seattle: 1,900. Estimated cost of constructing one parking space in a paved lot: $2,200. Estimated cost of constructing one parking space in a garage: $12,500. (from seattle.gov). Recreational bike riding is a safe, low-impact, aerobic activity for Americans of all ages. Bike commuting is an ideal solution to the need for moderate physical activity, which can be practiced five times a week. A 130-pound cyclist burns 402 calories while pedaling 14 miles in an hour. A 180-pound cyclist burns 540 calories while pedaling 14 miles in an hour. Bicycling can help solve two of our nation’s leading crises: skyrocketing healthcare costs, which are damaging every sector of our economy, and the obesity epidemic, which in 2000 caused 400,000 deaths, 16.6 percent of all deaths recorded, due to physical inactivity and poor diet. A study of almost 200,000 General Motors employees found that overweight and obese individuals average up to $1,500 more in annual medical costs than healthy-weight individuals. By getting people moving again, bicycling can help improve Americans lose weight and improve their physical fitness. This could not only save lives, it could help greatly reduce the total costs to society of obesity, estimated at $117 billion per year (including $39 billion a year through Medicare and Medicaid programs, which cover sicknesses caused by obesity including type 2 diabetes, cardiovascular disease, and several types of cancer). Recreational bike riding is a safe, low-impact, aerobic activity for Americans of all ages. A 150-pound cyclist burns 410 calories while pedaling 12 miles in an hour-almost the equivalent calories of a McDonald’s Quarter Pounder®. 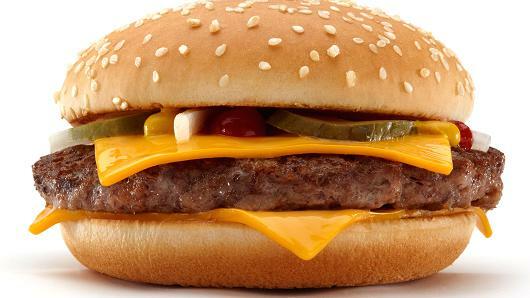 A 200-pound cyclist burns 546 calories while going 12 miles per hour-almost the equivalent of a Big Mac®. Sources: Exercise and Your Heart — A Guide to Physical Activity. National Heart, Lung, and Blood Institute / American Heart Association, DHHS, PHS, NIH Publication No. 93-1677 and McDonald’s. The President, the Centers for Disease Control and Prevention (CDC), the Surgeon General, and the Secretary of Health and Human Services have all recently expressed concern over America’s overweight problem. According to the CDC, 61% of adults in the U.S. are overweight or obese; 13% of kids aged 6 to 11 and 14% of kids 12 to 19 are overweight. Obesity is second behind tobacco in U.S. health risk factors, contributing to 300,000 deaths a year. According to the President’s Council on Physical Fitness and Sports, approximately 70% of US adults are sedentary. This includes 28% who engage in no leisure-time physical activities and 42% who undertake less than 30 minutes of physical activity (such as walking) each day. Bicycles are solely human-powered and use no fossil fuels. Bicycles currently displace over 238 million gallons of gasoline per year, by replacing car trips with bicycle trips. – League of American Bicyclists. The bicycle is ideal for so many things. Many, many countries have embraced the bicycle for their primary means of transportation. While it is not likely in America that all Americans can fully embrace the bike because of our existing infrastructure. We can greatly increase our use of the bicycle while at the same time making a healthier lifestyle for the environment and ourselves. For a lucky few who live in cities or close to where they work they have the ability to fully embrace the bike. Over the years mass transit has made great strides in helping cyclists get around more with their bikes. Many buses are equipped with bike racks and it is easier then ever to take your bike on the train today. Great things get started and happen with small steps. What can you do? Are there three or four errands you can use your bike for? Sometimes the hardest part is just getting started and making something new a part of your daily routine. So don’t delay get riding today!